SUBHEAD: Indigenous philosophies are reframing the law as it applies to the rights of the natural environment. 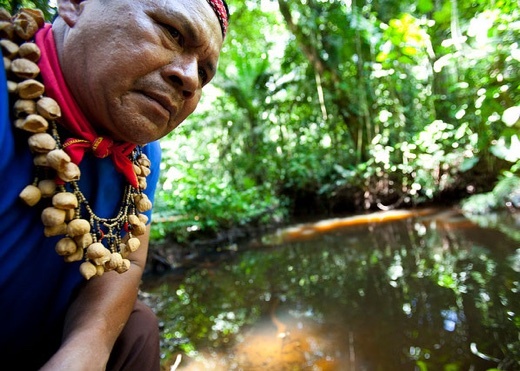 Image above: Cofan Indigenous leader Emergildo Criollo looks over an oil contaminated river hear his home in northern Ecuador. Photo by Caroline Bennett / Rainforest Action Network. From original article. Indigenous battles to defend nature have taken to the streets, leading to powerful mobilizations like the gathering at Standing Rock. They have also taken to the courts, through the development of innovative legal ways of protecting nature. In Ecuador, Bolivia and New Zealand, indigenous activism has helped spur the creation of a novel legal phenomenon—the idea that nature itself can have rights. The 2008 constitution of Ecuador was the first national constitution to establish rights of nature. In this legal paradigm shift, nature changed from being held as property to a rights-bearing entity. Rights are typically given to actors who can claim them—humans—but they have expanded especially in recent years to non-human entities such as corporations, animals and the natural environment. The notion that nature has rights is a huge conceptual advance in protecting the Earth. Prior to this framework, an environmental lawsuit could only be filed if a personal human injury was proven in connection to the environment. This can be quite difficult. Under Ecuadorian law, people can now sue on the ecosystem’s behalf, without it being connected to a direct human injury. The Kichwa notion of “Sumak Kawsay” or “buen vivir” in Spanish translates roughly to good living in English. It expresses the idea of harmonious, balanced living among people and nature. The idea centers on living “well” rather than “better” and thus rejects the capitalist logic of increasing accumulation and material improvement. In that sense, this model provides an alternative to the model of development, by instead prioritizing living sustainably with Pachamama, the Andean goddess of mother earth. Nature is conceived as part of the social fabric of life, rather than a resource to be exploited or as a tool of production. The traditional Quechua relation to the natural world is firmly rooted in the Constitution. The interchangeable use of nature and Pacha Mama testifies to the indigenous influence on the Constitution. In the 1970s, Christopher Stone, an American environmental legal scholar, articulated the legal notion of the rights of nature in his widely read essay Should Trees Have Standing? Stone envisioned a new way of conceptualizing nature through law that broke with the existing paradigm of the commodification of nature, often established through law. Property rights are a primary example of commodifying the natural world. When treated as property, nature incurs damages that often go unrecognized. Stone writes that an argument for “personifying” nature can best be considered from a welfare economics perspective. Under capitalist economic logic, many externalities that negatively impact the environment are not registered when calculating the cost of an action. Transforming nature legally from mere property to a rights-holding entity would force byproduct environmental effects of production to factor into cost calculations. Under this framework, nature would be better protected. Incorporating rights of nature into a national constitution is a powerful paradigm shift, but may seem hypocritical and idealistic given states’ continuing dependence on extractive industries. In Ecuador, 14.8 percent of the GDP comes from profits from natural resources as of 2014. Moreover, under Ecuadorian law, the rights of nature are subject to principles of so-called national development. Article 408 of the constitution stipulates that all natural resources are the property of the state, and that the state can decide to exploit them if deemed to be of national importance, as long as it “consults” the affected communities. However, there is no state obligation to abide to the result of the consultation to these communities– a gaping hole in full protection of these environments and the people living within them. Nonetheless, Ecuador’s Constitution was a significant step in changing the legal paradigm of rights to one that is inclusive of nature. Bolivia followed in Ecuador’s footsteps. Evo Morales, the first indigenous head of state in Latin America, was elected in 2005 and called for a constitutional reform that ultimately established rights to nature in 2009. Again, indigenous philosophies were instrumental in the formulation of Bolivia’s new Constitution. The constitution’s preamble states that Bolivia is founded anew “with the strength of our Pachamama,” placing the indigenous understanding of nature as central to the very creation of the revised political state. Like in Ecuador, the Bolivian Constitution allows anyone to legally defend environmental rights. Bolivia’s government soon instituted the Law of Mother Earth in 2010, later re-coining it as the Framework Law of Mother Earth and Integral Development to Live Well. The law lays out a number of rights for nature, such as the right to life and to exist, to pure water, clean air, to be free from toxic and radioactive pollution, a ban on genetic modification, and freedom from interference by mega-infrastructure and development projects that disturb the balance of ecosystems and local communities. Part of the rationale behind the law is the hope of helping the environment through reducing causes of climate change, which is directly in Bolivia’s interests. Increasing temperatures in Bolivia pose problems to the nation’s farming sector and water supply. Again, however, this legal concept does not match economic realities. The rights of nature are directly at odds with extractive industries that are intimately tied to Bolivia’s model of economic development. Despite legal frameworks defending the rights of nature, Bolivia’s profits from natural resources comprise 12.6 percent of the GDP as of 2014. But there are alternatives to the Andean experience. Across the Pacific, New Zealand has also granted a legal status of personhood to specific rivers and forest, thus enabling the environment itself to have rights. Unlike Ecuador and Bolivia, New Zealand’s rights of nature are not embedded in its constitutional law, but rather protect specific natural entities. Native communities in New Zealand were instrumental in creating new legal frameworks that give legal personhood, and thus rights, to land and rivers. New Zealand has bestowed legal personhood on the 821-square mile Te Urewara Park, and the Whanganui River, the nation’s third-largest river. This was part of the government’s reparation efforts for the historical injustice at the foundation of New Zealand’s state: colonial conquest of land from native peoples. The Tuhoe tribe’s ancestral homeland is currently the Te Urewara Park. With the imposition of colonial governance, most of their land was taken from them without consultation, resulting in great spiritual and socio-economic losses. The land was designated a national park in 1954. The Tuhoe tribe never signed the 1840 Treaty of Waitangi with the British Crown, which stripped the tribe of their sovereign right over their land. They have since contested the British assertion of sovereignty that undergirds the formation of the modern New Zealand state. Their centuries-long struggle finally yielded results. As part of New Zealand’s reparation process towards Indigenous Peoples, the national government negotiated with the Tuhoe tribe regarding their historic land. In 2012 the Tuhoe tribe accepted the Crown’s offer of financial reparations, a historical account and apology and co-governance of Te Urewera lands. The national government renounced ownership of the land, giving the land its own personhood. Under this framework, the land is now a legal entity in itself, owned neither by the government nor the Tuhoe tribe. The land is no longer property. It is its own untamed natural presence in and of itself, with, as per native understanding, its own life force and identity. The land is now co-governed by the Tuhoe people and the New Zealand government. The 2014 Te Urewara Act declares the park “a place of spiritual value.” The Act acknowledges that it is the sacred home of the Tuhoe people, integral to their “culture, language, customs and identity,” while also being of intrinsic value to all New Zealanders. In a similar process of granting legal personhood, the local Maori tribe, the Iwi, helped the Whanganui River earn legal personhood status in 2014 after winning a long-fought court case. This was part of a centuries-long struggle that the Whanganui tribes undertook to protect the river. Since the signing of the Treaty of Waitangi, the river has been subject to gravel extraction, water diversion for hydro-electric plans, and river bed works to better navigability, under protest from local tribes. The Maori fought to protect the river through a series of court cases beginning in 1938, defending their claim to the management of the river as its rightful guardian. Throughout the court cases, negotiations were undergirded by the native saying “Ko au te awa, ko te awa ko au,” which translates to “I am the river and the river is me.” This reflects native philsophies of reciprocal and equal relations between people and nature. The legal concept of rights of nature signal the influence of Indigenous Peoples as political actors in state-making, fundamentally reimagining law and how the natural world is conceived. These ideas present a revolutionary rupture in the conventional anthropocentric understanding of sovereignty, and a realignment of how the natural world is valued. In fact, they could chart the path forward for a new understanding of mankind’s relation to the natural world, even if they operate within the legal structures that are not conducive to indigenous philosophies. It is true that the rights of nature as they currently stand have deep limitations, particularly given the ongoing extraction of non-renewable natural resources in Ecuador and Bolivia. Problems of corruption, environmental inequality and economic dependence on extractive industries are major challenges to the full realization of the rights of nature. Yet small acts can lead to lasting change. This shift in the way we relate to and legally protect nature, however small and plagued by obstacles, could be an incremental step toward a more sustainable relation to the planet that could allow us to preserve the earth for future generations.